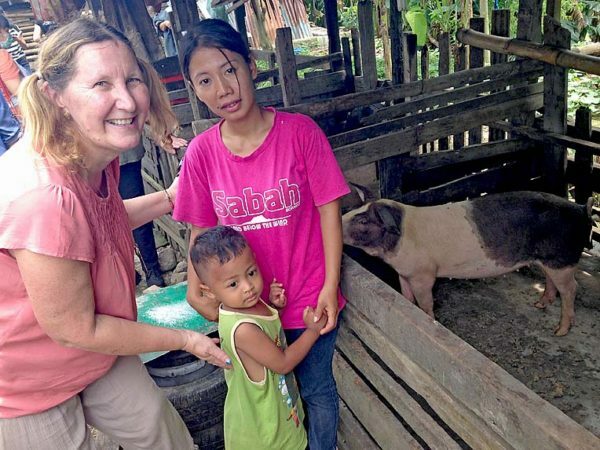 NEW LIFE: Helen Roberts with a mother and her son that where gifted with a sow to help their family. SIFTING through piles of rubbish and breathing in thick harmful smoke could become a thing of the past for some disadvantaged families in Indonesia thanks to former Mount Gambier resident Helen Roberts. From a young age, many Indonesian children are taken out of school and thrust into a life working in the dump, sorting through piles of rubbish to produce two-cent bags of rich soil.